October is dedicated to the memory of the Greek people with the feast of Saint Demetrios. 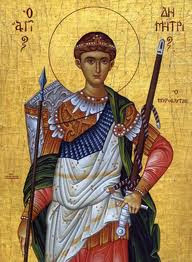 Saint Demetrios is one of the most beloved saints, not only in Greece but throughout the Orthodox world, as evidenced by the frequency of the name Dmitry, Dumitru, etc. It looks like this popularity is not unconnected with the sense of the continued presence of the Saint over the centuries, as evidenced by his appearances and miracles. As is known, the center of the veneration of the Saint is Thessaloniki, where he was martyred and where was erected in the early Byzantine years a majestic church in his honor. Thessaloniki has, historically, many reasons to honor Saint Demetrios and there began to be recorded from very early on his repeated miracles. The writing of a first collection of miracles is attributed to Archbishop John, after 600 A.D., and a second collection has an anonymous author that was written around 680 A.D. Historians have lifted a variety of information from these texts. Beyond the religious interest in these texts they are invaluable, especially for the movements of the Slavs in the 6th-7th century, and for life in Thessaloniki at that time as well. As has been noted by P. Lemetrle, whatever is referenced within is for us new material not mentioned in any other source. In 1979 Lemetrle made ​​a new critical edition and commentary of the text, and in the 1990s we had two versions in Greece with the original Greek text and a modern Greek translation. The first was done by the Center of Hagiographical Studies of the Holy Metropolis of Thessaloniki, curated by the late Professor Panagiotis Christou, and the second by Agra Publications, edited by Professor Christos Bakirtzi with an excellent translation by Aloe Sideris. The second edition, apart from the extensive comments (about 90 pages) of the scholar, includes drawings, 40 photographs and four studies about the "Miracles of Saint Demetrios" by Lemetrle, Speck, and Bakirtzi. Some miracles refer to physical healings of the sick, others to the care shown by the Saint for his church in Thessaloniki, and others to the protection of the city from enemy attacks. The writing of the texts are at such a high level, such a cultivation of wording and such expressive power, that they are proof of the high cultural level of the city during the early Byzantine period. It is addressed in the second person plural, as in public speech or preaching, and in many of them the speaker invokes the testimony of those who are in attendance to verify his words. In other words, these were events that took place during the author's life, which his listeners could confirm. Of the twenty miracles contained in Collections A and B (there is a third that was later published), we will make mention of the fourteenth, which is one of the most impressive. We are in September of 586 A.D. and a multitude of Avars and Slavs, perhaps one hundred thousand, are attacking Thessaloniki. "As a deadly wreath they encircled the city and not a piece of land could be seen where a barbarian did not step. It was worth it to see that instead of dirt or grass or trees were the heads of opponents from one side to the next, and they were even heaving to entail they were against us for the inevitable aftermath of death," writes the author of the "Miracles". The situation was tragic as there had been a famine that decimated the population of the city, and this sudden appearance of enemies shut out of the walls of the city many men who were out in the fields harvesting. Worse, most of the elite of the guard happened to have gone along with the prefect to other parts for public affairs. The enemies installed the machinery for the siege, iron rams and huge stone throwers, and they "began firing stones, or we could say entire mountains, and the arrows of the archers fell like wintry flakes, so that none of the defenders of the wall could return fire without danger and see what was happening outside." The Thessalonians were conquered by despair, as there was absolutely no human means to save them. Their only refuge was prayer and the supplications to their Saint to entreat on their behalf to God. And surely, Saint Demetrios interfered with specific incidents in various stages of the siege. "And though we were dominated by formidable fear for the fate that awaited us, suddenly, around the eighth hour of that same day, all together the barbarians that had encircled the city, left running with barbaric screams towards the hills abandoning their tents together with all their belongings. And such was their panic that overtook them, that some left unarmed and without robes. Then, after waiting around three hours in the surrounding mountains ... they came down again at the setting of the sun to their tents and began, by providence of the Athlete, to strip one another of their weapons, with the result that many of them were injured and fell dead. Then, after spending the night in complete silence, unlike the previous ones, and as it began to dawn, ... among the countless multitude not one could be seen." What happened? The Thessalonians did not know. Neither did the author, who was not misled to speak about apparitions and things that he himself had not seen. At this point, we could say that in a certain "modern" way, there is a change in the narration of the text and we read the description of the same event from the side of the invaders, for some of them the next day defected and sought refuge in the city. Conversations with their officials reported that after yesterday's offense they were ensured until now the army remained hidden in the city, because at the eighth hour they opened the gates and they were attacked by a man of many weapons, so they all panicked and ran to the mountains waiting there until dark when the army returned to the city. Then all the besiegers decided that at the next dawn the army will again set out against them. When the Thessalonians asked the fugitives whom they saw at the head of the army, they responded: "A man fire-blonde and brilliantly arrayed with a white robe, on a white horse," indicating to all the familiar image of Saint Demetrios, which survives today in mosaic. Shedding tears of joy and elation, throughout the city hymns were remitted to the Athlete Saint and thanks were given from deep within their souls to God. The contemporary reader, living in a time of rationality and distrust, approaches such books with reservation, dominated by the question: are all these things perhaps true? However our ancestors who lived in this place during Byzantine times had the same question. It is wrong and arrogant to think that in the time when those who created and led the cultural synthesis of Hellenism and Christianity took place people were simplistic and credulous. Rather, they were educated, possessing a classical education and they had the same need as we do for evidence of the supernatural claimed by each narrator. That's why the text of the "Miracles of Saint Demetrios" are peppered with many details that identify the time, place or site of the city, where each miracle took place. Arriving at the end of this book the contemporary reader is left with very few doubts about the historicity of the events listed. And I feel very privileged because in our time, for the first time, such projects are now available to the general public. Source: Ekklesiastiki Paremvasi, "ΤΑ ΘΑΥΜΑΤΑ ΤΟΥ ΑΓΙΟΥ ΔΗΜΗΤΡΙΟΥ", October 2001. Translated by John Sanidopoulos.